Rebecca DeGroot was born and raised with her three brothers in Michigan. With their woodworking father and a stay at home artist mother, her and her brothers have never been short of inspiration. Rebecca and her brothers were homeschooled from an early age, therefore given the opportunity to explore their forty acres and appreciate the nature and wildlife. Throughout her young life, she developed her love of teaching and sharing information with others. She later went on to pursue an education at Kendall College of Art and Design of Ferris State University in Grand Rapids, MI. After six years and an assortment of interesting twists and turns, she gained two bachelor’s degrees; one in Art education and the other in Sculpture and Functional Art. Before graduation, she received an offer to teach high school art at a school in Houston, Texas. The summer after graduation, she packed her things and made her way down to Texas to start this new and exciting chapter of her life. While it has been a challenge these past four years, Rebecca has always found time in her busy teaching schedule to create her own art. She now juggles teaching art, demonstrating woodworking and woodturning, and maintaining the regular production of her own gallery work. Eventually, Rebecca would like to focus all of her time on demonstrating and creating her own work, but we will have to wait and see when that dream will be made into a reality. 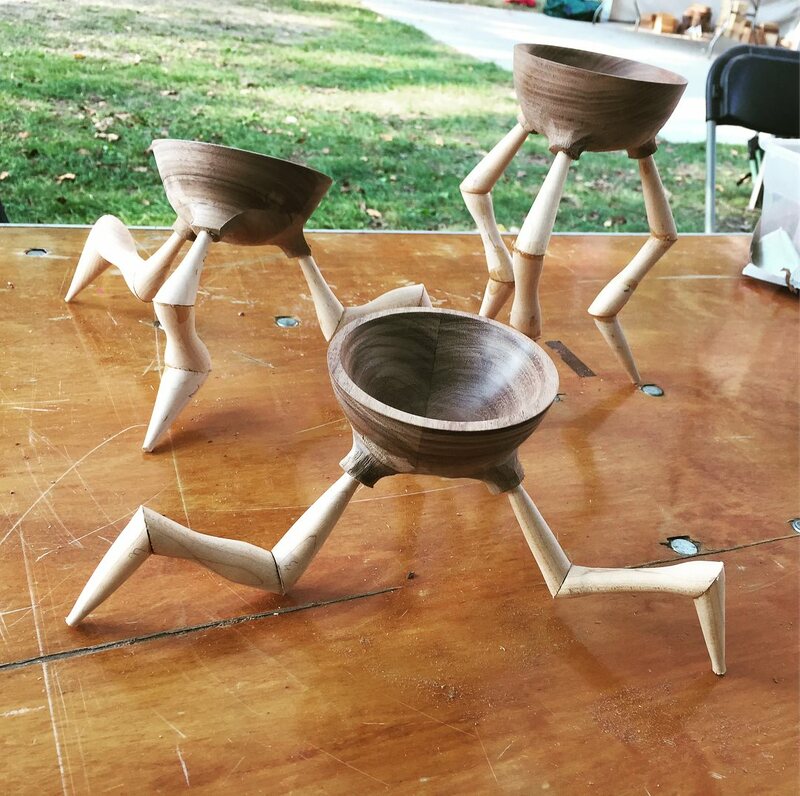 At the meeting, Rebecca will be demonstrating design basic concepts and the steps to create a three-legged bowl in her own style. She will be showing her own process of basic bowl turning, plotting an oversized foot, drilling and power carving the foot into “hips”, turning the spindles for the legs, cutting the legs apart, using splines to reinforce the leg joints, then reassembling the parts into a finished piece. If there’s time left over, she can go over embellishment techniques such as applying TransTint dyes, gold leafing, pyrography, and unexpected additive carved components. I am from Lubbock but have lived in Richardson for the last 42 years. I started turning in ’91 and joined WNT almost immediately. This was in the Ft Worth Paxton Wood store days. Clay Foster and Larry Roberts were my main “go to” guys when I had questions. A few years later, in the 1st Mike Wallace shop days, we got our first camcorder, eventually spelling the doom for the 45-degree giant mirror (YEA)! I immediately got involved in the video operations. That effort migrated to the yearly meetings of the Texas Turn or Two (now SWAT). For several years I was the A/V manager for SWAT. My other hobbies include Ham Radio and flying R/C model planes. My real airplane flying days are ancient history. I also enjoy golf (some days), building solid body electric steel guitars (one was turned between centers on my lathe), playing guitars and fiddles, and videoing airshows. Search YouTube “krodg41” for samples of my airshow videos at Addison and Alliance airports. 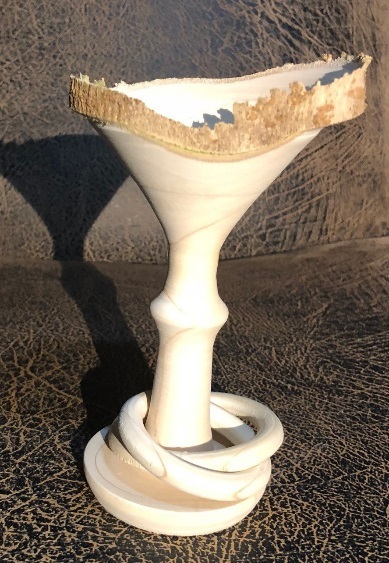 I enjoy turning natural-edge goblets from odd-shaped tree limbs, saving them from the landfill. 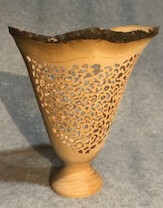 John Horn challenged me to learn how to add interlaced loose rings to my goblets. That is what I will be demonstrating for WNT in July. I will cover the goblet turning basics but will focus mainly on the interlaced loose ring aspect. Information on the upcoming meeting demostration is provided in the Monthly Newsletter. Usually posted by the 20th of every month. 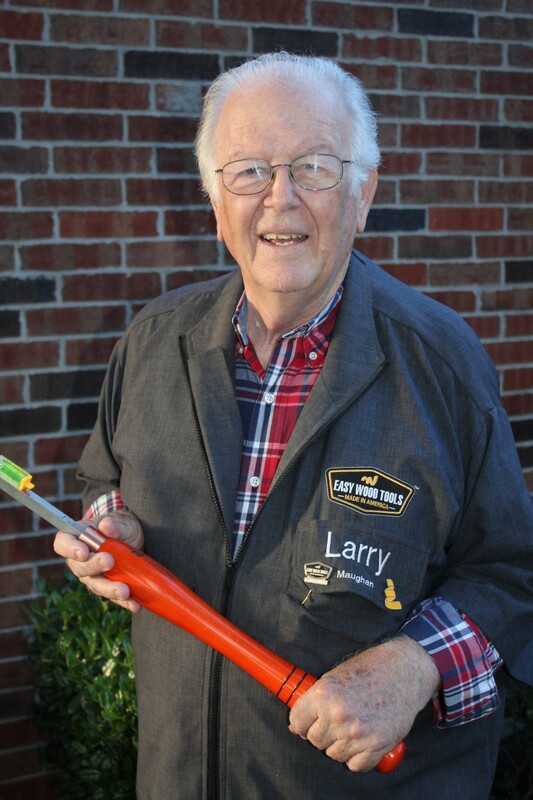 Our presenter, LARRY MAUGHN, has been working with wood since a youngster. During the last 30 years his focus has been on woodturning including pens, bowls, spindles, goblets and platters. He began using products from the Easy Wood Tools company some after the company began in 2008. 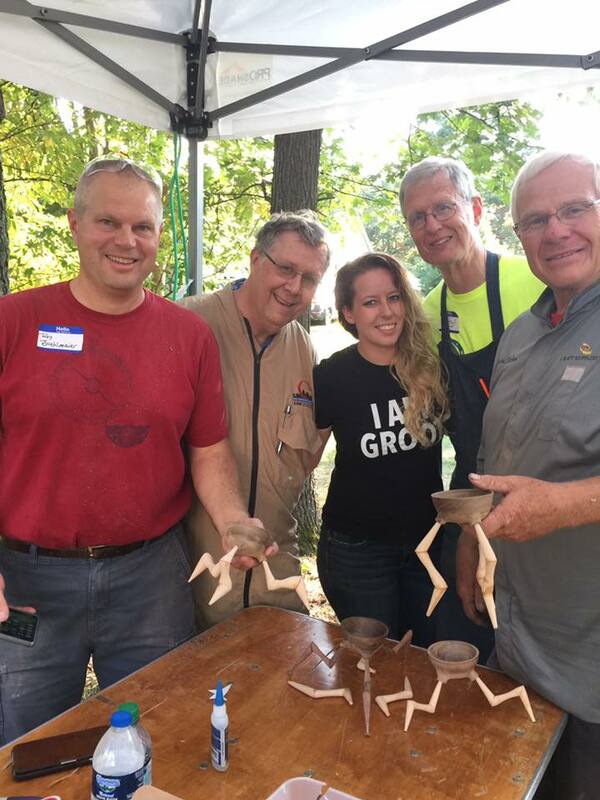 He is a Certified Instructor with Easy Wood Tools and has done turning demonstrations in most of the wood stores and area clubs. Larry is a member of the Dallas Area Woodturners and the North Texas Woodworkers Association. Hollowing can be done on wood, acrylics and other materials. It is often done to make lidded boxes, goblets, vases, and various shapes of bowls. Hollowing out a shape is done through small or large openings. There are many tools available for this process with fixed-tips – both straight, swan-neck shapes - or tools with swivel tips. In this demonstration you will see hollowing done using various tools with carbide cutting tips. These tools work well on either parallel or cross-grain woods mounted on the lathe. Most of us know that a bowl gouge is the preferred tool for most bowl turning where the grain runs 90 degrees to the bed of the lathe, but end grain turning is completely different in both the turning technique and the tools used. If a person looks at the tool catalogs, there will be a wide variety of tools for sale to solve the difficulties of end grain turning. Some of the tools are complete systems of components that are quite pricey to say the least. How is a person to decide how to select the tool or system of tools that will perform the task at hand? Is it necessary to get a large loan at the bank just to turn a few end grain vessels? Obviously, there are a large number of options, some of which are relatively inexpensive and others which are very expensive. By understanding the theory of how end grain wants to be cut, both the tools and technique choices become much more manageable. The demonstration will include information about the features and limitations of most of the end grain hollowing tools on the market and which tools and techniques would be best suited for different projects. Educated as an instructor of high school musicians, John has spent a major portion of his life teaching a variety of subjects from high school band and choir to adult computer applications. 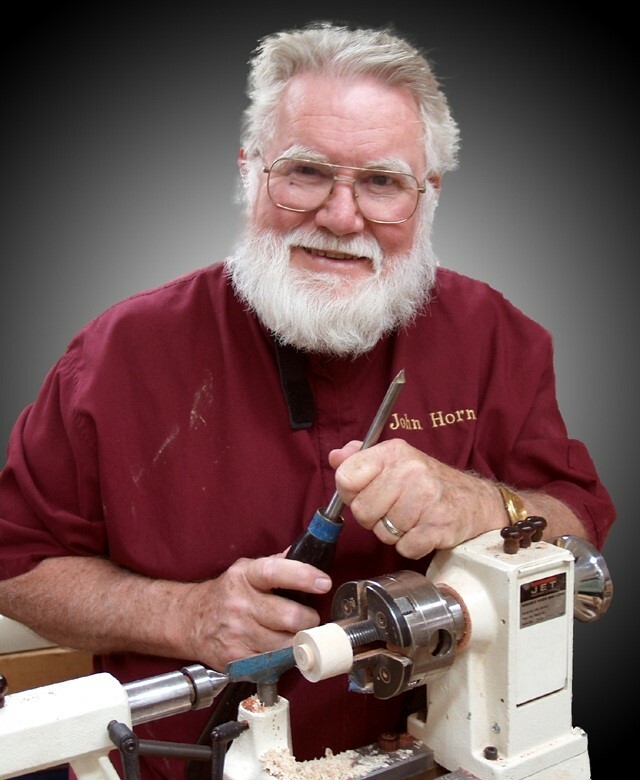 Now he teaches classes and one-on-one sessions on woodturning topics in his shop for beginning to intermediate turners. When he is not teaching and attending woodturning meetings, he stays busy turning contract jobs for corporations and individuals on one of his two Oneway wood lathes.